The country once boasted of 28 varieties of biryanis. BENGALURU: The country once boasted of 28 varieties of biryanis. The number has fallen considerably and chef Swatantra Verma says it could be because it does not suit our lifestyle anymore. To bring back the “lost flavours” from all corners of India, Big Brewsky is hosting a Biryani and Kebab festival. Big Brewsky, located on Sarjapur Road, has a curious architecture. The fortress-like restaurant has elevated walkways, ponds and fishes, and is adorned with a red Rajasthani umbrella at the doorway. The biriyani festival, its first edition, is being hosted at the spacious open-kitchen on the other end. Seated beside a green-lit pool, I am first served Murgh Parcha Kali Mirch that traces its origins to Lucknow. Boneless chicken is marinated with grounded black pepper and coriander. The meat is soft and the dominant flavour is of black pepper. The Delhi-style Moong Dal ki Tikki, made of green-dal paste, is even subtler. Tunday Kebabs, one of the signature kebabs of Lucknow, is delicious with minced lamb gently mixed with yogurt, cardamom, ginger, garlic, cloves and mint. The flavour is a burst of the citrusy aroma of cardamom and sweet essence of cloves. Dum ka Machhi Patrel Wali, fish kebabs wrapped in banana leaf, has Basa that is sweet and has a mild flavour. It is shallow fried, healthy and bland. The Hyderabadi Gosht Haleem was first made in the wake of an attack on Golconda Fort to save time and resources. Haleem was given to the army to keep them fit. This thick soup is heavy with mutton, wheat, ghee, butter and Indian spices. Next, we are served paratha, which was in fact the highlight of the festival. Malai Warqui Paratha is thick with fine layers and fried in malai and ghee. Served with sweet cream and toasted with silver coating, the paratha is sweet and crisp on the outside, and sweet on the inside. This paratha goes well with spicy kebabs. Eight different varieties of biriyanis are served next, in matkas. From the bright red Ambur Chicken Biryani to the white Doodh Biryani, each had distinct flavours and textures. Trying all eight biryanis could be heavy on the pocket as well, so the restaurant also offers an unlimited package at `799. Doodh Ki Gosht Biryani, which is unheard of and not as popular as the Hyderabadi Biryani, also originated in Hyderabad. The biryani is flavoured with creamy milk and roasted with nuts and minimal spices. The opposite of its fiery counterpart, the chef says, it appeals to the Europeans. Ambur Chicken Biryani is rated the spiciest of all. The biryani from the Arcot region of Tamil Nadu has small-grained Seeraga Samba rice, which is fluffy and distinct from the Basmati rice. But, it is mildly spiced. 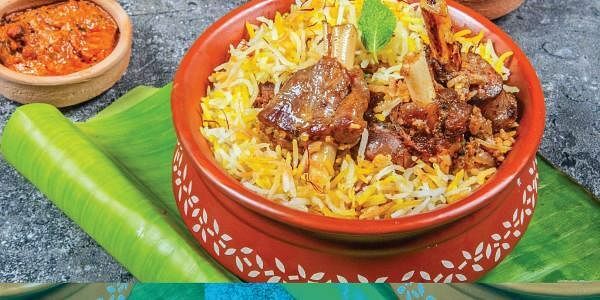 Hyderabadi Gosht Dum Biryani, a blend of Mughlai and Iranian cuisines in the kitchens of the Nizam, is flavoursome with meat marinated overnight in yogurt. Kolkata Gosht Biryani is similar in taste to Lucknowi Biryani because it was introduced to the city when Awadhi Nawab Wajid Ali Shah was deposed. However, it is a lot more subtle in taste because of limited resources available in the region. Vegetarians can have Kathalki Biryani besides Milk Biryani. The mock meat or the unripe jackfruit also has a soft meaty texture. The festival, Biryani and Barbeque trails, is on till February 26.